When reclusive war poet Olivia Marlowe and her half-brother, Nicholas Cheney, die together in their ancestral home on the Cornish coast, it looks like suicide. The grieving relatives gather together to discuss the fate of Barcombe Hall, when another shocking death occurs. Inspector Rutledge, who is still shell-shocked from his experiences in the Great War, is sent from Scotland Yard to investigate. Rutledge is soon convinced that the answers to this baffling case lie within the family’s secret history. I have so far liked this period piece series which I started near the end before going to book 1, which I enjoyed. This story suffers from some inane dialog and a detective too stupid to know when he needs help from other law enforcement authorities. Building suspense from actions no reasonable person would take, is not my idea of the way to develop a story. Nonetheless, if you like this series, this story, with its authentic post WW I feel, will likely keep you interested. 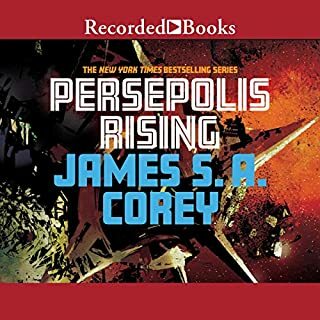 I have enjoyed all the volumes in this series, but Persepolis Rising is perhaps the best. The authors seem infinitely imaginative and this story is a great combination of speculative science and a close look at the human condition. With real characters with real frailties, the novel outdoes most of its competition in which one character is pretty much interchangeable with another. Kudos to the authors for bringing it off. My only regret is having to wait for the next book. At least I don't have to worry about Battlestar Galactica. My last contact with the story was the original 1978 TV series with Lorne Green as Commander Adama. Perhaps listeners are expecting too much from this work. 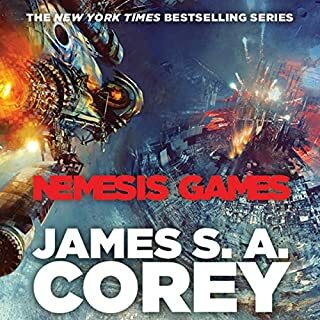 There's a lot of military sci fi out there and while much of it is exciting, and plenty of it is bad, expecting great literature is a no-win situation. If you want a great story, break out the list of 100 best all time books. Read Camus, Steinbeck, etc. Looking at this story in isolation, it's got some interesting twists and turns, a different kind of alien than one usually sees, a lot of political intrigue, and good battles. The narration is pretty good. At times the book is overblown, heavy-handed, preposterous and Geranger can be a bit of a clod. Par for this genre. Still, I'm enjoying the series for what it is. I've read and listened to a lot worse. I've listened to book 2, Warrior, and it's somewhat better. I will have to read book 3 as there doesn't seem to be an Audible edition yet. why a lower rating on performance? 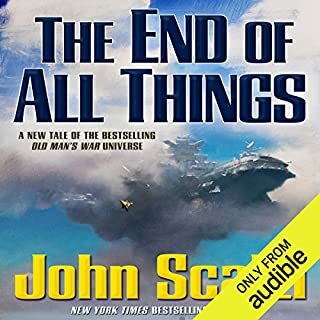 John Scalzi can be relied upon to spin a good tale and this novel is no exception. It's a complicated story, with a lot of political maneuvering, and the plot design generally works well. As in some of his other works, the author invites the reader into the writing process. Here, there is a prequel that then leads into the main story and an alternate prequel tacked on at the end. I'm not particularly happy with this structure. I enjoy hearing or reading about the writing process, but not when it's part of the story. In this work, there are abrupt shifts of narrator and points of view that, to me, are a distraction. I would prefer a more tightly constructed effort. The alternate version of the prequel, tacked on at the end, after everything is resolved, serves no purpose except to suggest that it was a vastly inferior first draft. It is pretty much standard practice for good authors to write, then improve upon, their first go-around, but I don't need the first draft to enjoy the story. I do not want to suggest that this book is not worth a listen. My problems with it are minor and I think virtually all Scalzi fans will like this latest, (? last) addition to the Old Man's War series. I really like this book. It continues the story of the crew of the Rocinante, split up, and each confronting a deadly crisis. The stakes are high in this story and it's a high octane thriller that is hard to put down. Yet, in contrast to most other thrillers, the characters are very human and well-developed. We know a lot about them already and learn much more about their pasts. 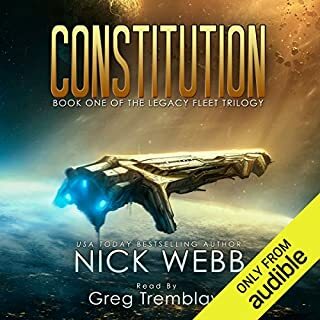 I would recommend that listeners read the short novella, "The Churn," before listening to this audiobook, as it will make Amos Burton's part of the story more understandable. Credit should be given to Jefferson Mays for an outstanding narration. I don't know if Audible listeners know much about him, but he is an accomplished Broadway actor, with a Tony to his credit, and has appeared in TV shows and films. He makes a great story even better. A good way to end! This is a gripping story that, at last, brings this long-running saga to a close. A few surprises, desperation at the climax, and smart protagonists save the moon. 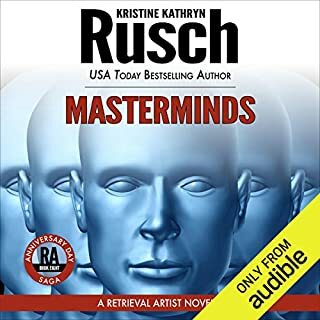 The plot is complex, and it's not possible with audiobooks, to easily review a part of a previous book to refresh your memory. Nonetheless, the plot and subplots are usually easy to follow. I have enjoyed the Retrieval Artist series and the Anniversary Day spinoff, of which this is the final volume. Hopefully, the author is not done with Miles, Noelle, and Bernard and stories about the moon. On the plus side, good plotting, distinctive characters, and an interesting environment make the series a worthwhile read or listen. The narration is first-rate. On the minus side, I'm still not sure how domes section and I can't conceptualize the links. Everybody has so many, they must take up half their skull space. The author gives no explanation of FTL flight, or FTL communication. And I don't have a good idea of what constitutes the habitable universe. The characters ruminate and parse their actions excessively ending with, "I have to do it now," over and over to the point where the expression seems lame. Nonetheless, I think most listeners will like the series. 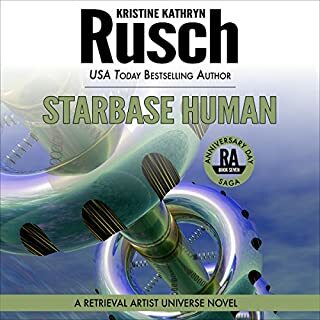 Can the fate of a forgotten starbase hold the key to the moon’s survival? Long before the Anniversary Day bombings brought the moon to its knees, a far-flung starbase became the testing ground for a diabolical plan: the annihilation of every human inhabitant by an army of clones. As promised, Ms Rusch has gotten down to business and moved the story forward with plenty of action. Those of us who have waded through, and paid for, middle chapters in the saga which should never have been separate books, are now rewarded with a story beginning to tie up the loose ends in the saga, and there are plenty of them. Lots of good detective work, tense drama and the usual good character development are present in abundance. A good penultimate episode. Thousands of years ago, artifacts of the early space age were lost to rising oceans and widespread turmoil. Garnett Baylee devoted his life to finding them, only to give up hope. Then, in the wake of his death, one was found in his home, raising tantalizing questions. Had he succeeded after all? Why had he kept it a secret? And where is the rest of the Apollo cache? Antiquities dealer Alex Benedict and his pilot, Chase Kolpath, have gone to Earth to learn the truth. 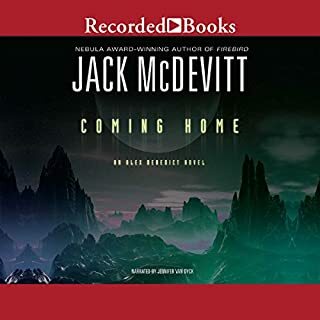 Jack McDevitt is one of my favorite authors because his stories are more cerebral and less violent than many other sci-fi offerings. I have always liked archeology and history and this book gives you plenty of both, giving a vast perspective on McDevitt's particular universe. There is a mystery to be pursued in past history and an attempt to rescue space travelers stranded in warped spacetime, and the author brings these two tales together in a masterful manner. I like Jack McDevitt's future universe; it's cozy, comfortable and a lot like today's if you subtract the advanced science. In fact, life on Rimway seems a lot like life in the past here: a sort of future nostalgia. People go to lakeside restaurants, dance, listen to pretty music and are usually polite and civilized, more like the 1940s and 50s than today. No computer implants, or bio-enhancements, no disincorporated entities. It's a relief to find humans still human thousands of years in the future. I highly recommend this book and hope the series continues. Jennifer Van Dyck's reading continues to be exceptional. At the beginning of this episode, the author promised a better story and she delivers. While I'm still not happy paying for fragments of one long book, this section of the tale is better and really moves the story forward. There is action, good detective work, and a feeling that there may yet be an end. 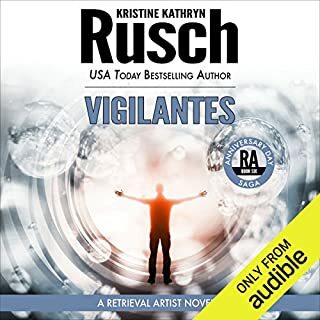 The narrator does a good job with Rusch's quirky style and many characters. I'm looking forward to the next episodes in this series. I loved this book. 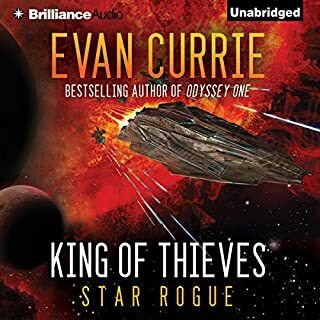 I have been a fan of the Odyssey One series since the first book and this current book is no less enjoyable than previous episodes. This volume, apparently in a new spin-off series, with a new hero, is really great space opera. Lots of problems to solve, very interesting speculative physics and some new monsters make for a great listen. The band of explorers get side-tracked looking for clues to the source of the Drasin, but learn new things about the universe they live in. I was sorry to have the novel end and look forward to the next book. 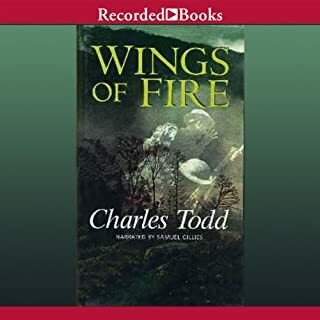 I did not initially like the reader's voice, but he did an excellent job of keeping the excitement going and playing the multiple characters in the story.